Though the news has been filled this week with stories about the drug-resistant tuberculosis that infected the quarantined lawyer from Atlanta, there is another drug-resistant bacteria that may have already infected millions of Americans. A new study in the Archives of Internal Medicine finds that levels of drug-resistant staph infections rose sevenfold in a segment of Chicago from 2000 until 2005. The bacteria, known as MRSA, are usually found in hospitals and other health care settings. According to Dr. Mallika Marshall, a frequent Early Show guest, MRSA, or "mersa," stands for methicillin-resistant staph aureus. 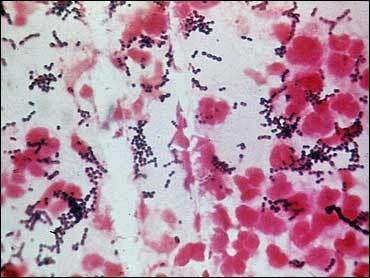 "It's a common bacterium that has become resistant to the penicillin class of antibiotics," she explained. "They are affectionately called superbugs because they have become so difficult to treat, and the more resistant an infection is to antibiotics, the harder it is to treat." Penicillins, she said, are "fairly well-tolerated by most people, but if penicillins are no longer an option, we have to move to other drugs that may be more expensive or more toxic." Health care professionals fear that the superbugs can be killers. "Staph aureus usually causes skin infections, but it can also cause pneumonia, bloodstream infection, and so called flesh-eating conditions," said Marshall. "And yes, these types of infections can be deadly — especially if they don't respond to conventional treatments. And, heaven forbid, the bacteria become resistant to other drugs we have available — they will become even deadlier." MRSA is not the only drug-resistant bacteria wreaking havoc in hospitals, said Marshall: "Other germs, such as Vancomycin-resistent enterococcus, are also causing significant illness." The infections are becoming more widespread every year, said Marshall. "Federal health officials estimate that about one in 100 Americans, or about 3 million people, have MRSA bacteria on their bodies. And it may not be causing illness now, but there's still a chance they could sick or infect others." According to Dr. Marshall, good hygiene is your best defense. Wash your hands thoroughly and often — preferably with soap and water. Alcohol-based hand sanitizers are a good alternative. Clean cuts and scrapes. They're a prime entry point for the bacteria, so keep breaks in the skin clean and covered until they've healed. Marshall says that according to the research, there are two groups that are particularly susceptible to infection: People who play contact sports like football might be at added risk due to skin-to-skin contact and cuts and abrasions, and health care workers are at risk since they often treat wounds, change dressings, and touch people on a daily basis — even if they always wear gloves.